I suppose I should give things to you in that order, food and then music since this is a food blog after all. The salmon and rice are both recipes I made a long time ago but never got around to posting, (picture quality is usually the reason for late posting, but sometimes I simply mislabel/lose photos and then have nothing to show for my efforts). I should really stop telling you that I made certain dishes a long time ago and let you assume that I post about things on the day I make them, it would make me seem much more accomplished. I’m posting this one today though because I’d like to get back in the habit of eating fish twice a week, because I like to. I don’t have any excuse for not doing it, fish is the ultimate 30 minute meal as it cooks in no time. I’d even go so far as to say it’s a 20 minute meal, (take that Ray Ray!). I just have to actively seek out new fish recipes so that I don’t resort to baking it on a bed of lemons all the time. That’s what I usually do and it’s delicious, but it can get a little boring after a while. 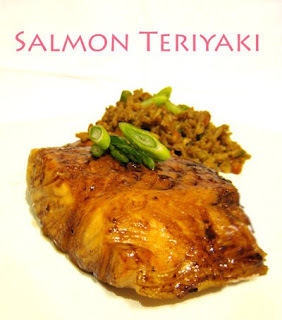 The teriyaki recipe I used on the salmon this time wasn’t boring, was easy to make, (falling into my 20 minute meal guidelines) and could be used on veggies or chicken too. The Vegetable Fried Rice is from my favourite Steamy Kitchen, (the Jumbo & Jaden Project strikes again!) so obviously it’s great. If you have not read this particular post from Jaden, go over there and read it now whether you want the rice recipe or not, (which of course you do) because it’s hilarious. I think I made this rice purely because I loved the post that went along with it so much. You’ll also want to go visit Jaden’s blog to see a much nicer photo of what your rice might look like. From my experience, (that’s not saying much, I know…) fried rice works best with day old rice so make a little extra next time you’re having rice for dinner and then you can have this the following night. Ok, on to the music! Hurrah! I love music and there are lots of new things happening lately. Many artists are choosing alternative ways to release their music to the masses, rejecting traditional forms and the constrictions placed upon them by record labels. Last year Radiohead released the album In Rainbows as a name-your-price digital download with massive success and other bands and artists are following suit and developing new ways to put out music. 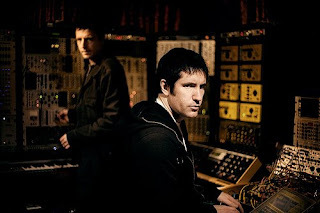 Earlier this year Trent Reznor released the four part album Ghosts I-IV without giving any warning that it was coming. It’s an instrumental album that was made available in many different ways, ranging from a free download to a $75 deluxe set, (which sold out). Last week NIN finished a new track called Discipline, mastered it in the studio and released it to radio within 24 hours of its completion. It’s awesome and you can download a copy of Discipline for free via the NIN website by clicking here. And then click back to NIN.com on May 5th for some sort of announcement, I’m hoping for more downloads, but I’m greedy. 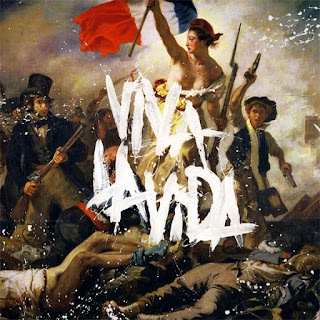 Coldplay has a new album, Viva La Vida, (album art is pictured below) which will be released in its entirety in mid-June but they have also opted to make the first single, Violet Hill, available for free download. You can download a copy of Violet Hill via the Coldplay website by clicking here. If you’re having trouble getting the Coldplay song, wait a while and try again later, I think the site’s been overloaded as it took me a couple tries to get the song, but it was well worth it. That’s all for now. If anyone wants to give me free tickets or take me to see these bands, that would be super… I’ll make you dinner in exchange. It’s clearly an amazing deal all around. Everyone wins. In a small saucepan simmer sauce ingredients, stirring until sugar is dissolved, until reduced to about 1/2 cup and cool to room temperature in a metal bowl set in a large bowl of ice and cold water. In a baking dish large enough to just hold salmon steaks in 1layer marinate salmon in sauce, turning to coat, 15 minutes. Preheat broiler. Line broiler pan and rack with foil. Arrange fish on rack in a single layer, not touching each other, brush with melted butter or margarine, and sprinkle with salt and pepper. Just how long fish should be broiled can only be estimated by size and shape. For a 1/2-inch cut steak, the steak should be 2-inches away from the heat and you should cook the first side 3 minutes and 3 to 5 minutes on the second side. Posted by Brilynn at 11:16 p.m. The salmon recipe looks good, but I like the music post. I haven't heard the new coldplay album, but I wasn't a huge fan of the old one. However, I am loving In Rainbows more and more every day. I just got finished listening to the whole thing again about an hour ago. And that new NIN track is really good. In Ghosts reminds me of some of the instrumental work from The Fragile. I don't like it nearly as much as the fragile (or at least not yet) but it's great calm and soothing music to do work to. The Mr just asked for fish tonight. Im taking my inspiration from you. Bri, salmon and fried rice is one of my favorite dish combos. And that album cover is just beautiful! I hadn't seen it before. Hey - truth be told, I don't usually get something posted until about a month after I made it. So you aren't the only one! And one of my favorite salmon recipes has a very similar marinade. Your post is making me crave it! I was just looking at my large piece of salmon and wondering what am I doing here? I have every ingredient you mentioned in the fridge. This will be our dinner tonight. Salmon teriyaki is one of my all time favorite meals. It is so easy to make and so tasty! I understand completely why a food blog should have a JADEN CATEGORY! She has a refreshing way of telling her stories that one can't help but hang on every word! And hey! JUMBO AND JADEN is good category too as you're not shabby either! I enjoyed going through your posts very much! 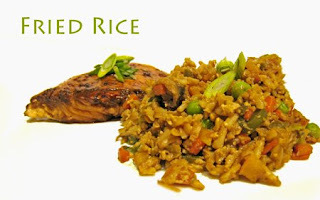 Love salmon and fried rice together -- in fact, I even make a salmon fried rice, with a kind of orange-soy flavor base, that is truly delicious. I love salmon! This sounds like a yummy recipe. Must try. That glaze on that salmon looks super good! i love salmon too. i made a salmon teriyaki a while back (recipe on the blog). i love the way you served this with fried rice too. love salmon, love teriyaki, love coldplay... all great picks from you, have you tried quil eggs roasted with teriyaki sauce? Gotta love an easy salmon recipe. We are addicted to salmon around here. Wish I could snag some tix for you! Love your posts, and the dish looks delicious, even for someone who is not a big fish eater, like me! My family loves salmon. I have presented you with an award, just check out my blog! I'm a Trent Reznor fan. I really liked NIN in the 90s. I appreciated your little update. Hi! Thanks so much for the good wishes, and the welcome to the Daring Bakers. I'm excited to get started! Your blog looks fantastic -- the salmon is mouth-watering!